Originally, escondidinho (pronounced es-kohn-jee-JEEN-yoo or es-kohn-dee-DEEN-yoo, depending on the region of Brazil) was made from carne seca (sun-dried beef) topped with mashed cassava and cheese (queijo de coalho). As you see, it follows the same general concept of a cottage pie, popularly known as shepherd’s pie. But just as cottage pie has its many variations, so does its Brazilian fellow, escondidinho. Nowadays, escondidinho may be made from chicken, charque (a meat similar to jerked beef), shrimp, ground beef, or codfish, among other things. One has not changed though… It is always topped with mashed cassava or yuca and cheese (mostly queijo de coalho). Although halloumi cheese from Cyprus has a similar taste and texture to queijo de coalho, I adapted my escondidinho de frango to incorporate a simple melting cheese (e.g. fontina, cheddar, gouda, gruyère, asiago, etc). 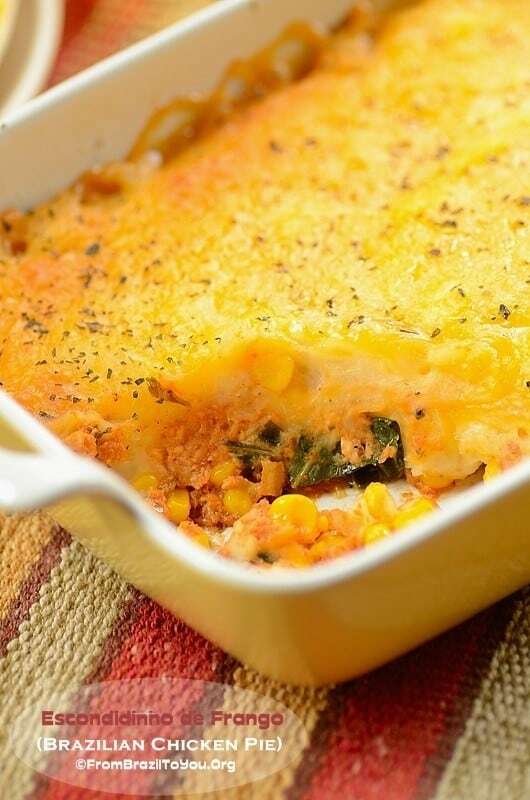 Similar to the cottage pie in its origins, escondidinho was a dish created by the poor and affordable to all. Escondidinho de frango can be served by itself (one dish wonder) or accompanied by a fresh salad or steamed vegetables. It’s really up to you! I made this escondidinho de frango — along with other dishes– for a Brazilian friend’s baby shower that I hosted at my house. I was so happy to eat it again after such a long time, as well as to see everyone’s else excitement at having escondidinho de frango. 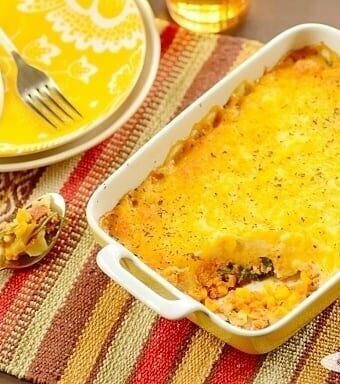 Escondidinho de frango (Brazilian chicken shepherd's pie) is a homey, comforting one dish wonder or casserole that can be made from leftovers!!! To prepare the mashed cassava/yuca: If using fresh cassava or yuca, peel it first (frozen cassava, such as Goya brand, is already peeled). Then, place peeled cassava in a pot filled with cold water and let boil over high heat for about 15-20 minutes or until fork-soft. Remove from the heat, reserve about 1 cup of the water, and drain. Place cooked cassava on a cutting board and while cassava is still warm but can be handle without burning, remove the woody fiber from the center. Place warm cassava back into the pot, pour the reserved warm water on top, and mash very well using a masher. Stir in the butter, heavy cream, chicken bouillon (optional), salt and pepper to taste. Set aside. Cheese will be used later in the assembling of the dish! Preheat oven to 350 degrees F (177 degrees C). Butter or spray (with non stick cooking spray) a 13 x 9-inch (about 33 x 23 cm) baking dish and set aside. To prepare the chicken: In a medium to large non stick dutch oven, cook the diced bacon over medium-high heat for about 5-6 minutes, stirring occasionally with a wooden spoon. Remove bacon from the pan with a slotted spoon, place into a bowl or plate, and set aside. In the same pan where bacon has just cooked, sweat the onion in the residual bacon fat over medium heat for about 2-3 minutes, stirring occasionally. Then, add the minced garlic and let cook for about 1 minute over medium heat. Add the shredded chicken and sauté over medium-high heat for 1-2 minutes, stirring occasionally. Add the greens and sauté for about 1 minute. Add the wine and let almost evaporate. Stir in the tomato sauce, the reserved cooked bacon, and salt and pepper to taste. Let cook uncovered over medium heat for 3-4 minutes. Remove from the heat, stir in the cooked corn kernels, and the chopped parsley or cilantro. Set aside. To assemble the escondidinho de frango (chicken pie): Spoon chicken mixture in one single layer into the greased baking dish. Layer mashed cassava/yuca on top of the chicken layer. Finish by sprinkling shredded cheese on top of the mashed cassava/yuca, distributing uniformly. Cover tightly with a sheet of aluminum foil (Please, make sure that the foil does not touch the cheese or grease the inner part of the foil with cooking spray so cheese won't stick to the foil). Bake for 30-40 minutes. Serve escondidinho de frango warm by itself or accompanied by a fresh salad or steamed vegetables. Enjoy!!! There is more than one way to make escondidinho de frango (or Brazilian chicken pie). This is my version which takes corn and collard greens in it. Oh this is sure making me drool. Looks so good. Looks like its the Yellow theme going on here 🙂 Love the color! Fantastic recipe Denise! We ‘re gonna have to use potatoes & swiss chard as we don’t have any cassava/yuca or collard greens here, but we’re sure the result will be amazing! Thank you! Wow-that cassava/yuca layer looks incredible! I am a hooooge fan of shepherds pie but have never had it with cassava/yuca before! Loving the collards in the chicken layer – another brilliant idea Denise! Cassava is a very popular root in South America, used to make an array of both savory dishes and desserts. It is more versatile than potatoes. In Brazil, it is used to make mashed cassava, fries, chips, casseroles, soups, as a thickening agent for stews, etc. It’s great in cakes and also flan. It is the bomb!!! If you make this pie recipe, you won’t be disappointed at all. Thanks a lot for stopping by!!! Great idea of adding yuca instead of potatoes.. What great flavors..Love it.. This is the way that we make this type of casserole in Northeastern Brazil where cassava is abundant! Wonderful, hearty dish that makes my mouth water, Denise. I love yucas, they add such a delicious touch to this pie. Never seen any sort of sun dried beef before, i guess i’m gonna use corned beef or bacon instead…..
Dedy: This one is made from chicken but you can use any type of meat. The lush yuca and cheese topping is so enticing! Such a sublime casserole! What a fun and delicious variation of shepherd’s pie. Brazil certainly has the best food! Chris: Thanks a lot! My country has great food indeed…I wish people know more about and try it. I don’t recollect seeing a sheperd’s pie as gorgeous as this one before. Makes me want to break into the cheese and enjoy the deliciousness. Brazilian food rocks! Thanks, Sonali! I know that I am suspicious to say it but Brazil has great, great food indeed. This would be such a huge hit with my hubs, he loves all variations of shepherds pies and this looks so sunny, colourful just perfect for brightening the day! I hope you make this for him, Gintare! The mashed youca gives this dish a singular touch. Shepherds pie is a true favorite of mine, and your version looks incredible! I’d love to try it soon, as the yuca topping sounds delicious. Love the cassava topping! Delicious looking shepherds pie and I like that it’s made with chicken. I seem to be going off meat lately. Nazneen: I see… My body seems to have a bit of difficulty to digest red meats lately. So I have been eating more poultry in general. Anyway, I am already used to eat much less meat than when I was younger. Oh Denise, looks fantastic and very delicious…!!! I hope you do try it, Jessica! This is a fave of mine! What a colorful dish! And I’ll bet the flavor is fabulous! Love this recipe — thanks so much. Wow this is the first time i heard yucca used in sheperds pie, I would love to do this we love yucca at home and use it only on sweet desserts. I hope you try this , Raymund. In Brazil, yuca is used both in desserts (cake and flan) and savory dishes (casseroles, fritters, chips, soups, fries, mashed yuca, etc). It is a great, versatile root! I never heard of this dish before Denise…thank you so much for the introduction…I love mashed yuca and yes paired with chicken just sound perfect…yum! Mashed potatoes is a great substitute for cassava, Liz! Enjoy!!! This really is a lovely dish, I like that it can be done with almost any left over. I bet with shrimp is going to be our fav. It can be made with any meat or even seafood, Amira. But if you make with shrimp, the baking time should be decreased. Actually, since each layer was previously cooked, only bake it enough for the cheese melt (about 7-10 minutes) in order to avoid the shrimp get rubbery. I would combine the shrimp with any fish that you like. Hi, Karen! I love flans… and the cassava one is one of them. Actually, I don’t remember one single dish made from cassava that I have not fell in love with. Thanks for stopping by! Thanks, Aurica! This is a complete meal! Es riquìsimo cuando estuve en Brasil pobrè este pastel es una ricura ahora para el mundial mi marido va a brasil y lo probarà de nuevo,abrazos y saludos de Chile que espero lo conozcas. Hola, Rosita! Bienvenida a FBTY!!! Fue al Chile una vez (Lago Esmeralda) y me encantó muchisimo. Un dia me gustaria conocer Santiago. 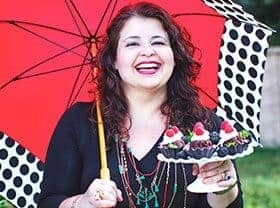 Espero que su marido tenga una buena estadia en Brasil y desfrute de la comida. Un abrazo!! !